YSaC, Vol. 1566: Everybody’s had Faith. You gotta try Faith. YSaC, Vol. 731: No deposit, no return. Wow, a purple love seat. What kind of idiot would want a purple love seat? Uh, One? I think that’s maroon. Oh. Wow, a purple love seat. What kind of maroon would want a purple love seat? I actually got the joke here. 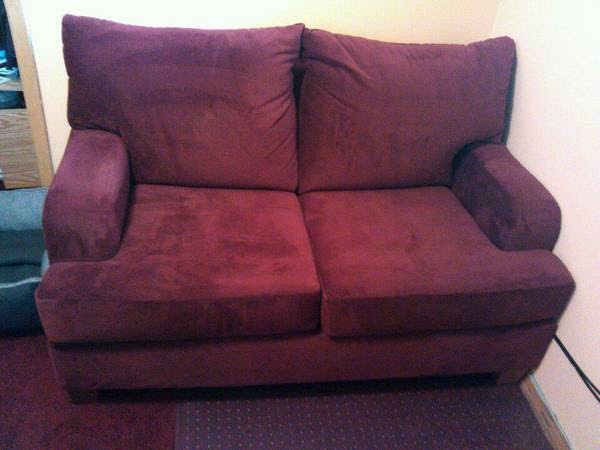 Obviously a 5 foot maroon would want a purple love seat. Wait, this is Tuesday, right? Did I wake up on Wednesday? WTF are these strange little holes in my belly? And, why am I standing outside in my jammies? Well, Sunday was Monday this week, so, yeah, Tuesday is the New Wednesday. Yes, well all well and good, but I SEEM TO BE MISSING A KIDNEY!!! And all they left you were the stones! Better than standing outside in your jellies. Or standing outside getting your jollies. Besides, that wasn’t even an ottoman. It was a trashy step stool with that someone reupholstered with velvet sweatpants and leather fringe. Well, lets see. I could put you in my storage unit. I have one of those you know. The problem is the winters here. with all of the snow, spring run-off might seep under the door and you might get wet. Then you might get moldy or mildewed. I could send you to a relative of mine. He is always replacing his furniture because it breaks. His immediate family and friends are really hard on furniture. You may be headed or the curb in about six months. I could sell you off… er rehome you for some rehoming cash on craigslist. Would you like that? Maybe you’ll wind up with some lonely person who doesn’t have anyone to love. I know you don’t like it when “loving” is done on you. And you’re such a good listener too. Maybe you’ll end up with a stockbroker and you can call me with some inside information. Hey, that’s a good idea. I’ll go put you in a craigslist ad. You know, it’s not a good idea to have furniture with two cousions in your house. All kinds of hanky panky could start going on. Unless you live in the south that is. Well sure, they’re kissin’ cousions. Or, unless one is a Lannister . . . It sounds like an improvement over the settee that claimed to love me but never listened to a word I said. 5 Foot Maroon is my Prince cover band. I used to be a 5 foot maroon just like you, then I took yellow in the knee. But then who is your Maroon 5 cover band? My sense of time is all off! So here’s the Monday box-emptying post: C”one”J, Ralph, and C”two”J, Punchity Punch Punch! That has to last you for a whole week! I had one of these once, only the guy I bought it from said it was a catamaroon….took it out sailing once….ONCE. Is Sparky willing to listen to OBOES ????? So, yeah… we’re in Europe right now, and we have no idea what day it is. Next post will be Friday. Or maybe Thursday. But we should be back to normal next week. Week after, tops. Dan, I really need you to define “normal”. Is that African or European? And no repressing the anarcho-syndicalists with the violence inherent in the system . . . I saw the X-Men movie and have no impulse to see The Fault in Our Stars, so maybe this furniture and I would get along? Though I draw the line at invading other countries. You say this now, but after some moist bint invests supreme executive power in you by lobbing scimitars your way, you are then faced with the sorts of difficult decisions that position requires.